A Scottish rider competing with British Cycling North East and a Welsh rider have won VIP treatment at the Tour of Britain in September after taking home the yellow jersey’s at the Youth Tour of Scotland. 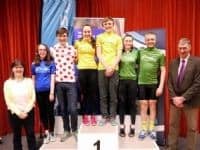 Dylan Hughes, 15 and Ella Barnwell, 15, were the overall winners of the four day stage race which took place in Perthshire last weekend. Around 140 cyclists took part in the event which attracted entries from across the UK and Europe. The Scottish Cycling Youth Tour of Scotland, which returned for a fifth consecutive year, saw teams from Belgium, Isle of Man, Ireland and Wales competing in the event, with some roads around Perth being closed to accommodate the cyclists and hundreds of spectators. The stages of the cycling tour included routes around Forteviot, Coupar Angus and Strathallan School, Forgandenny. Winners jerseys were presented by Mike Williamson from Perth and Kinross Council, Strathallan School’s Director of Sport Audrey Syme, Scottish Cycling’s Head of Performance Gary Coltman and Head of Development Vicky Strange. “I am incredibly proud of all of the riders who took part in the Youth Tour of Scotland, the event has gone from strength to strength each year and the talent who come from all over the UK and Europe has upped the competition too. Stage 1 of the Tour of Britain, British Cycling’s premier road cycling event, will come to Scotland in 2016. The opening race in the eight-day series will depart from Glasgow City Centre on September 4, concluding in the scenic Dumfries and Galloway town, Castle Douglas. The Tour of Britain 2016 is funded by Dumfries and Galloway Council, EventScotland and Glasgow City Council. Based at the Sir Chris Hoy Velodrome in Glasgow, Scottish Cycling is the recognised national governing body for cycling in Scotland. Scottish Cycling work across all six cycling disciplines: BMX, Mountain Bike, Cyclo-Cross, Road, Track and Cycle Speedway in 178 clubs throughout Scotland, with over 650 events across the disciplines providing lots of opportunities to participate. From encouraging people to ride their bikes for the first time, to helping Scots compete on the international stage. Scottish Cycling also works in partnership with British Cycling to provide support across all levels of the sport in Scotland, as well as helping to nurture home-grown talent to compete at a world and Olympic level as part of a successful GB cycling team.